People will do anything to keep the hype going. That's the lesson I learned from the Manti Te'o story. Actually that's the second lesson I learned. The first lesson I learned about Manti Te'o was the one that Eddie Lacy delivered a few weeks back as he ran around, through, over and under Te'o in an Alabama a$$-kicking of the Notre Dame football team and especially of Te'o, whose job it was to stop the run. Ok well Eddie Lacy made Te'o look silly. But Lacy did that to a lot of people this year. No big deal, right? Te'o was still a character guy at a character school (Notre Dame) who had been through a lot of tragedy with his grandmother and girlfriend dying so close to each other (within 6 hours). Te'o was everything that was right about college football. He was classy, honest and hardworking. If he could persevere despite those body blow tragedies then surely we lesser beings could get off our keister, get out there and win one for the Gipper, right? Well not so fast. Deadspin did some very basic fact checking of Te'o's story and started to find some discrepancies. The fact checkers found some very ugly and obvious discrepancies. Like no one had ever seen this Te'o girlfriend. Evidently Te'o had been dating Mr. Snuffleupagus. His girlfriend did not exist. Upon receiving the news of the two deaths, Te'o went out and led the Fighting Irish to a 20-3 upset of Michigan State, racking up 12 tackles. It was heartbreaking and inspirational. Te'o would appear on ESPN'sCollege GameDay to talk about the letters Kekua had written him during her illness. He would send a heartfelt letter to the parents of a sick child, discussing his experience with disease and grief. The South Bend Tribune wrote an article describing the young couple's fairytale meeting—she, a Stanford student; he, a Notre Dame star—after a football game outside Palo Alto. I don't know why a grown man felt the need to make up a girlfriend that didn't exist and continue to claim things about her, even after by his own admission, he knew she didn't exist. That makes no sense to me. All I will say for sure that Notre Dame and Te'o are full of crap, as is the entire NCAA system but that's a different story. I think that both Notre Dame and Te'o knew the value of a good story and decided to roll with it, regardless of whether they came up up with the original con or not. (and I think Te'o did) And all I know is that as a Michigan Man I couldn't be happier to see Notre Dame and Te'o revealed as the lightweight lackadaisical lying lowlife losers I always knew they were. Please read the entire deadspin article and weigh in. 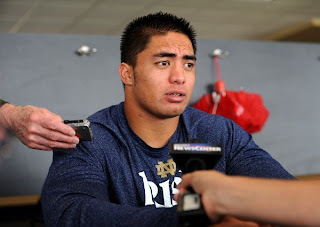 Do you think Te'o is telling the truth about being conned? Is it possible to fall in love with someone who never existed? Should this give NFL teams pause before drafting him?